At the opening plenary of last week’s National Conference on Tobacco or Health, Dr. Howard Koh, M.D., MPH, U.S. Department of Health and Human Services, compared our health to a gift. More than 2,000 tobacco control and health advocates from across the country gathered in Kansas City to talk about how tobacco use hurts our gift of health. In the course of three days, many statistics and data were shared. 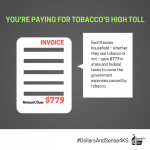 75 percent of our health care dollars are used to treat chronic disease, many caused by the harmful effects of tobacco. 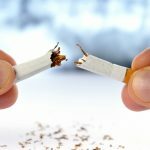 Two new people under the age of 26 start smoking every day. More than 3.5 million youth use tobacco products. Three out of 4 high school smokers will smoke well into adult years. 88 percent of adult smokers tried their first cigarette by age 18. Smoking prevalence is highest among adults with a GED certificate (45 percent) and lowest among adults with a graduate degree (6 percent). 31.1 percent of people living below the poverty level smoke, compared with 19.4 percent of those at or above the poverty level. 23 percent of American Indians/Alaska Natives smoke. This is a higher rate than any other racial and ethnic group. Latinos (14.5 percent) and Asians (12 percent) have the lowest smoking rates. 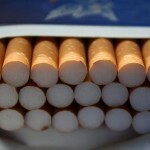 Big tobacco spends $1 million per hour to attract people to use their products. While 52 percent of smokers make an attempt to quit every year, only 6 percent succeed. The return on investment in prevention initiatives is $5.06 for every $1 invested. Of all the information shared, advocates beamed with pride when they learned of the 33 percent decline in consumption of cigarettes over the past decade. Yet there’s much work still to be done, so we were cautioned to not give up the tobacco control efforts that have largely attributed to the decline, especially among those populations with higher prevalence rates. As the statistics show, there are still ongoing economic, racial/ethnic and other social disparities. We know that there is a much higher smoking prevalence among American Indian and Alaska Native men and women. We know that persons whose household incomes are below or near the federal poverty level have a substantially higher prevalence of smoking, and that smoking rates significantly decrease with increasing levels of educational attainment. Understanding how to effectuate behavior change in these populations is paramount if we are to achieve our objective of reducing cigarette smoking and improve the nation’s health status overall. The CDC encourages us to increase community awareness of disparities, set priorities among disparities to be addressed at the federal, state and local levels and implement targeted intervention strategies based on lessons learned from successes in reducing other disparities (such as in vaccination rates). As the conference came to an end, we heard closing remarks from U.S. 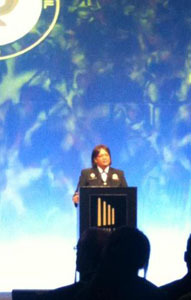 Surgeon General Regina Benjamin. Dr. Benjamin reminded us that health doesn’t occur just in the doctor’s office – it occurs where we live, eat, play and pray. As a nation and as a community, we need to shift our focus from sickness and disease to a focus on wellness and health and make prevention part of our everyday lives. We know what can happen when we work together to prevent poor health outcomes – the tobacco control community is proof.